I have to say it’s all a bit embarrassing – forgetting about network capacity is a bit of a rookie mistake. In our defense, most people doing scalability probably don’t deal with applications that access over 30 megs of object cache memory to service one request. 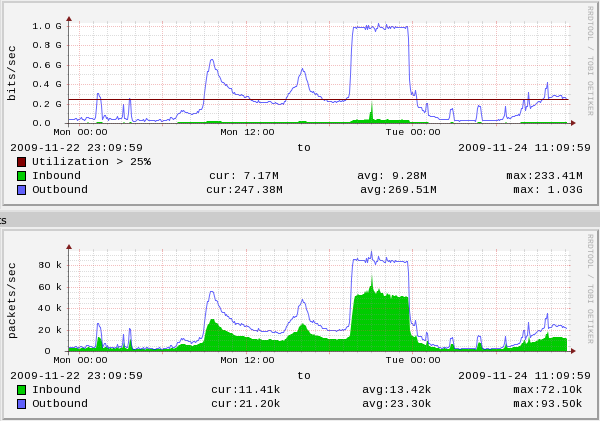 The shape of our load spikes (when we advertise websites on primetime on BBC One) is probably a little unique, too. update: I was mistakenly using “APC” in the above to mean “cache” but APC is just the “opcode cache” and is completely disjoint from “object cache”. D’oh! Curious, why didn’t you put the memcache instances on the front end boxen at the beginning?